✔ USDA Certified Organic - Maca is a root vegetable, cultivated for thousands of years in Peru, used as a tonic for stamina, fertility and libido. modern research has shown that Maca can alleviate symptoms of stress and fatigue. ✔ 60-DAY BETTER-THAN-MONEY-BACK GUARANTEE! Order now with peace of mind. If you are not 100% satisfied with our product, tell us within 60 days of your purchase and we'll give you a full refund, no questions asked! 100% CUSTOMER SATISFACTION GUARANTEED! See product description below for more information. ✔ RESEALABLE/RECLOSABLE BAGS preserve the freshness to make the product last longer. These bags seal well and keep the rich, pure and incredible maca powder aroma intact. Each time you open the bag, the refreshingly subtle and confection-like smell is heavenly. ✔ SUPERFOOD. Maca contains several amino acids which are the building blocks for protein, helps boost your energy while working out and a strong source in losing weight. Also best known for increasing stamina, if you find yourself tired most of the time, a small dose of Maca is what you need. Contains Vitamin B1&2, E and C.
✔ MACA IN YOUR RECIPE. 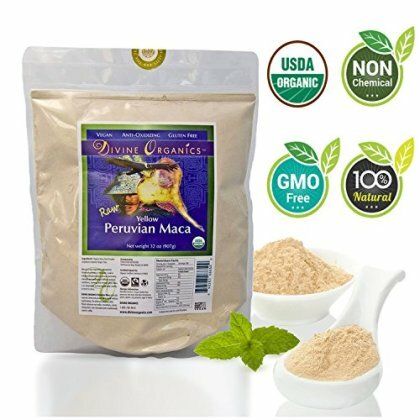 Divince Organics Maca Powder may be added to any beverages or food, just add a tablespoon of powder to your smoothies, teas, yogurts, puddings, oatmeal, homemade chocolates, muffins, cookies, bread or even to your favorite meals!